At first, I landed on a company named SkyWay Invest Group…A site that is written in Russian so the info comes from the browser translator…A company that has to do with transport projects. Researching more and came across SkyWay Capital, another Russian transporting company where on the about us page refer to a matrix company named SkyWay Group of Companies. On the SkyWay Capital website, the “External Partners” page redirects to a 404 (error – not found). 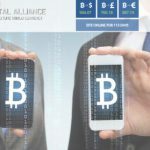 The other main “Partners” page is about the income opportunity. ..A domain search uncovers registration taking place on November 2014 with an expiry date on November 2016, in less than one month. The owner is shown and is Evgeny Kudryashov. SkyWay Invest Group – an educational investment project, trademark of Rail SkyWay System. Experts in the field of investments can teach us how to save and multiply our capital choosing the optimal tools for our portfolio. High tech Euroasian Rail SkyWay Systems Ltd.
By doing so they help people raise their level of personal income and/or become shareholders of high-speed safe environmentally compatible transport. Since September 2011 more than 100,000 people have completed their investment training courses. ..A quick search for the domain uncovers registration taking place in July 2014. The owner is using privacy for personal data. ..Searched for the Keywords “Academy private investment”, “Euroasian Rail”, “Euroasian Rail SkyWay”, “Rail SkyWay Systems” in my Keyword Research Tool (not on search engines) but returned no results meaning no one is searching for these terms. ..another search on Google for Euroasian Rail SkyWay Systems Ltd uncovers a pdf doc published from the Bank of Lithuania (Lietuvos Bankas)…informing people that by performing supervision of markets in financial instruments , warns investors that individuals who invite (online or by public channels) residents of Lithuania to invest in next-generation string transport by acquiring shares of the above company, are engaged in illegal activities…September 2014. The Bank of Lithuania has not approved the prospectus for shares of Euroasian Rail SkyWay Systems Ltd. Therefore if you invest you risk losing your money. Igor Romanenko – investor and shareholder, director of SkyWay Russian company. Further research tracks the official website of SkyWay Group of Companies found on rsw-systems dot com. The white logo SW has the same design with the Light Blue SW of SkyWay Capital. That means we have a solid connection between these 3 websites. The SkyWay Capital and RSW-Systems use the same logo and the SkyWay Invest Group is the one mentioning RSW-Systems (Rail SkyWay Systems). Additionally, the last 2 use the same Favicon (a curve) in different colors, white and blue accordingly. As a result, a new search for the rsw-systems domain uncovers registration in January 2014 under the name of Nadezhda Kosareva and brand named Global Transport Investments Inc. The “Clients” page on SkyWay Invest Group shows a European map with circled numbers indicating how many clients there are in each area but they are not mentioning any names or brands. April 2015 – Video report that shows the area of EcoTechnoPark territory where the development center for innovative SkyWay transport systems will be built. September 2015 – Australian transport expert (Rod Hook) visits the Park and together with Anatoly Yunitskiy who is the President of SkyWay Group, examine the territory. 20 Oct 2015 – Press Release – grand opening of the sign of SkyWay zero kilometer. 18 Feb 2016 – the Expert Council under the Ministry of Transport of the Russian Federation acknowledged SkyWay string technology as innovative…(just an image showing 3 raised and windy outdoors SW flags). 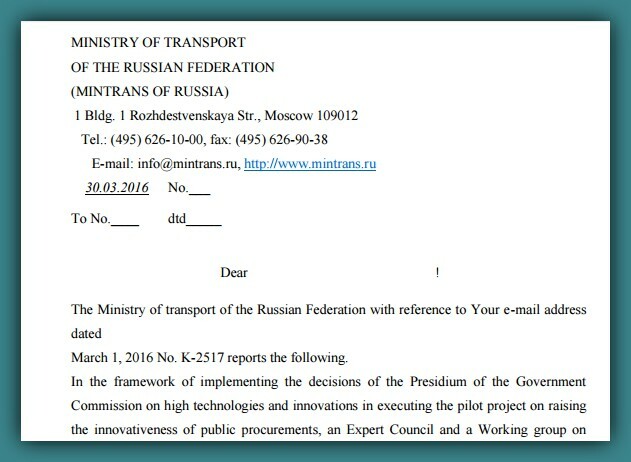 …as a result of that, a new search on Google uncovers the official website of the “Ministry of Transport of the Russian Federation” found on the URL .. mintrans dot ru – a federal executive authority in the transport industry. Unfortunately, the English version of the site is not translating much except the main summary. All the buttons and links are still in the Russian language. 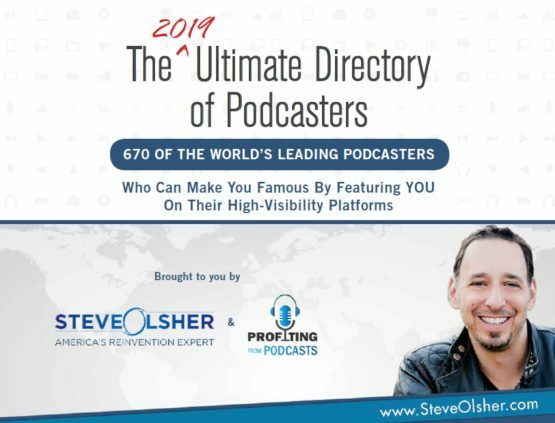 There is no search option either so I tried the sitemap button which is not working at all. A new search on Google for the term ..”mintrans ru skyway group” in order to link SkyWay Group on the Ministry website returned nothing. However, what seems most interesting I found an uploaded pdf doc on the RSW-Systems domain showing a translated version of the Ministry corresponding approval but… there is no official stamp on it. Just letters and a sign at the end of the document. Moreover, the same search tracked a distributor or investor of SkyWay Group announcing the opportunity to others on a forum mentioning that ..” the opportunity to invest in SkyWay may disappear in 2016 because a European major Venture Funds are planned to enter into the company”. A fundamentally new transport system which is eco-friendly, safe, comfortable and significantly cheaper compared to all existing solutions. The EcoTechnoPark will transfer SkyWay string transport from a theoretically developed project to a good selling product. 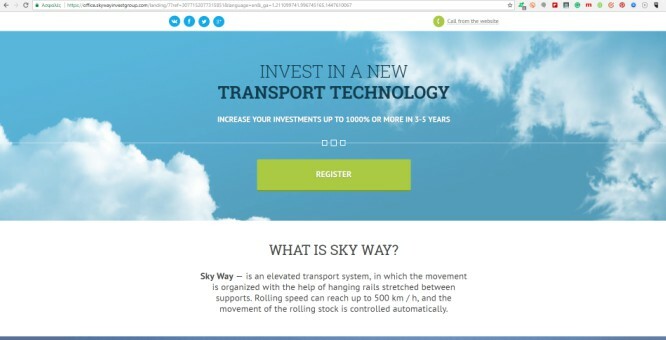 At last SkyWay Group official website clearly, links the other 2 SkyWay Companies. The majority of start-ups fail…blah blah …you should only invest an amount you are willing to lose…..If a business you invest in fails, the company will not pay you back the investment. A certificate of the company’s registration back in 2006 acknowledge an investment group that can be engaged in the sale of shares. Investing in new transport technology even small funds, you will get the investment increased by 1000% or more in 3-5 years. SkyWay is an elevated transport system in which traffic is arranged by means of suspended rails stretched between supports. The speed of the rolling stock can reach 500 km/h and its motion is controlled automatically. Profitable allocation of funds. You purchase shares of the company at the discount of up to 500 times of their face value and when the company enters the global market you will obtain capitalization from 1000% or more. 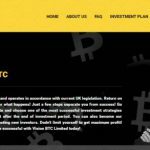 The official Group website mentions that the English version of the business plan is at the stage of translation now. Partner – 15% of personal sale in money and 7,5% in shares… 7% of sale on the 2nd level in money and 3,5% in shares… 3% of sale on the 3rd level in money and 1,5% in shares. You can withdraw only if you invested 50 units or more. Agent – 15% of personal sale in money and 7,5% in shares.. 7% of sale on the 2nd level in money and 3,5% in shares… 5% of sale on the 3rd level in money and 2,5% in shares.. 4% of sale on the 4th level in money and 2% in shares. It is necessary to invest at least 200 units. The minimum sum of a withdraw from a Bonus Account is 50 c.u. (units). Consultant – 15% of personal sale in money and 7,5% in shares.. 7% of personal sale on the 2nd level in money and 3,5% in shares.. 5% of personal sale on the 3rd level in money and 2,5% in shares.. 4% of personal sale on the 4th level in money and 2% in shares…From 1 to 1,5% in the 5th level and more in money and from 0,5 to 0,75% in shares.Necessary to invest 500 units. The minimum sum of a withdraw from a Bonus Account is 50 c.u. (units). Leading manager – 15% of personal sale in money and 7,5% in shares.. 7% of personal sale on the 2nd level in money and 3,5% in shares.. 5% of personal sale on the 3rd level in money and 2,5% in shares…4% of personal sale on the 4th level in money and 2% in shares.. From 2 to 2,5% of sale on the 5th level and more in money and from 1 to 1,25% in shares.Need to invest 2000 units. The minimum sum of a withdraw from a Bonus Account is 50 c.u. (units). Adviser to the President – 15% of personal sale in money and 7,5% in shares.. 7% of personal sale on the 2nd level in money and 3,5% in shares.. 5% of personal sale on the 3rd level in money and 2,5% in shares.. 4% of personal sale on the 4th level in money and 2% in shares ..From 3 to 3,5% of sale on the 5th level and more in money and from 1,5 to 1,75% in shares.Need to invest 8000 units. The minimum sum of a withdraw from a Bonus Account is 50 c.u. (units). President – 15% of personal sale in money and 7,5% in shares.. 7% of personal sale on the 2nd level in money and 3,5% in shares.. 5% of personal sale on the 3rd level in money and 2,5% in shares.. 4% of personal sale on the 4th level in money and 2% in shares.. From 3,5 to 4% of sale on the 5th level and more in money and from 1,75 to 2% in shares.Need to invest 26000 units. The minimum sum of a withdraw from a Bonus Account is 50 c.u. (units). Crucial information on the MLM compensation plan is missing. We have to wait for the translation. But how can we proceed with an investment without knowing what to expect? I feel that the “Time is Not Right” to invest in SkyWay Technology, at least not yet. The project is in the development stages, 2 years passed and still, they are building the construction. When will the transport services be available to the public? The domain of SkyWay Invest (1 of 3 websites) expires in less than a month. Let’s see what happens with that. The letter of the Bank of Lithuania generates questions for the owners and the legitimacy of the company in general. I could not verify the official acknowledgment of the Ministry of Russian Transport Federation that the SkyWay technology is innovative as they claim. They underline that over 100,000 people have completed a SkyWay training but there is no information on the education classes whatsoever. I will repeat their slogan here …“Investing in new transport technology even small funds, you will get the investment increased by 1000% or more in 3-5 years.”….how can they be sure of such a statement? The construction is not finished yet when this company is supposed to start making sales?..and what about other economic factors that can’t be calculated or measured/predicted? They say that you get an up to 500 times discount on the nominal value of shares. And when the company enters the global market our investments will skyrocket in profits. How can they compensate their investors when the project is not ready yet?…are they going to use new investments/funds to pay off existing affiliates? The total cost of this construction must worth millions of dollars. When this company will start making profits?…The time when retail sales take place? How they plan to cover the initial costs? The Fares for this transport system are low compared to the existing technologies How many years does this company need to Break Even? Are they going to sell the SkyWay technology that is worth $400 billions? Why they don’t do that now and get the funds they need? If the SkyWay group at the final stage is a transportation company offering services to the public the operating and other costs (employers, engineers, managers, drivers, supplies, fuels, offices … just to name a few) are Huge…Will The Low Transport Fares cover all of that? I would wait, just to be sure…If SkyWay is a company that came to stay there is no need to rush things. The new videos that the company published online are very interesting but still, we have no concrete news. For me, this is a risky investment. But if anything changes, who knows! I wanna thank Jan, who shared a link to his latest comment yesterday. It is a new video presentation of SkyWay, published on Jan 19, 2017. I wanna thank Armands, who shared a link to his latest comment yesterday. It is a new video presentation of SkyWay, published on Dec 05, 2018. That’s it, another review has finished, here on Web Market Support. I am waiting for your comments and thoughts. Have you invested in that company? Then I would like to hear from you. Till next time. Thank you for this conversation stream discussing SkyWay Group investment. I hope that investors in SkyWay do not lose their money. But it seems to me that investing in this company is extremely risky. They have not received permission in any of the countries they are active in to sell shares. Warnings have been released about the SkyWay Group in Lithuania, Belgium, the Czech Republic, Germany, Greece, Italy, Norway, New Zealand and Slovakia. Each warning is different and relates to the specificities of the SkyWay Group in these countries. There are many shell companies that belong to this group. The Belgium warning says they have the characteristics of a pyramid scheme. The New Zealand warning states that they may be involved in a scam. A friend of mine was convinced as part of a complex presentation to invest money tax-free. I had to advise him after doing extensive research that it is extremely likely he will lose his money as they are selling shares in Belgium without permission and the small-print of the documentation provided by SkyWay absolves themselves of any liability. They recruit small-scale investors all around the world but I’ve never read any stories of anyone actually making any money. The success of this project is dependent on the technology and all they have are the test models in EcoTechnoPark. All the people that provide positive commentary have been recruited in their countries; there are many commentaries on visitors to this park where investors can go and plant trees and see actual models there. 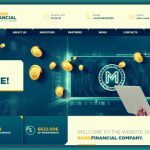 People who are enthusiastic about the project appear, however, to be everyday investors who have no scientific background and are not really qualified to make judgements about whether this technology is any good or not. There is practically no third-party scientific assessment of the EcoTechnoPark in Belarus or the technology that is not by the inventor (Yunitskiy) himself. YouTube films, copies of contracts, maps and computer-generated images are not actually verifiable scientific evaluation or assessment. The company was banned in Lithuania, Yunitskiy and his wife were arrested and they were forced back to Belarus in 2014. Although the Lithuanian government finally decided they could not prosecute the company for being a pyramid-scheme, they did not revert their original decision and the company was unsuccessful in suing the government for loss funds. People should be aware of the international warnings of the activity of the SkyWay Group. Investing money in major infrastructure projects is highly irregular. The English Wikipedia article on the SkyWay Group and its talk page details recent activities of this company with many links to verifiable resources and translation of articles critical of SkyWay. Luckily you have the freedom to invest your money wherever you want and this freedom to spend your money is an inalienable right. But don’t be convinced by people who tell you unverifiable and outlandish facts about their company. Welcome Zachar, I do hope that Skyway investors don’t lose their money too. On the other hand, the company has not yet verified its position and future goals to the public. There are plenty of You-Tube videos and other fancy presentations but still, there’s something missing. There is no solid proof that any investor is making any money yet. And the project is not new at all. I pretty much agree with your statements, and I wanna thank you for the news you bring on the table. I did not know that Skyway had to deal with so many warnings in so many countries. If you have news about your friend that invested in Skyway or anything else we’d love to hear from you. Thanks, Tomi, for this addition, very interesting. It seems the construction is in the very early stages. I wonder when this project will be finished. 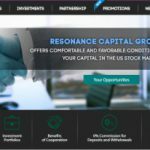 As a long term Share and Stock trader I am always looking for opportunities like IPO’s, I started doing due diligence on Skyways Investment Group about a year ago, made a small investment and checked out every aspect of the company, I was very skeptical of SWIG at first and I was very weary about it. As of yesterday I have now just purchased a much higher investment and now own a substantial amount of pre IPO shares, In my opinion everyone should invest a small amount into SWIG as this company is going to become a world leader in transport and is a company that I am more than happy to recommend and become a shareholder of. As for the crowd funding this has proven to be an extremely efficient way to fund large and small projects that helps let anyone get a share and bypasses the corruption of the big banks. I wish your predictions are true and you don’t lose your investments. But how can you be sure that this company is going to be a leader? Please, give us some data on this. Take a look at their latest company news on their site and Linkedin, There are already working systems constructed in Belarus, construction is underway in Dubai, Moscow and Brazil have signed construction contracts and Anatoly Yunitskiy awarded the Slovenian International Peace Prize. Thanks for the update, Paul. Very interesting stuff! This company looks like MLM scheme. how could they double the money 1000%, this is impossible. it is only possible by asking you to engage more members and the first one gets their bonuses and the last one will lose everything. this company gonna vanish soon. i have seen their videos and website, all of them are just on paper and in animated videos only, nothing is real. and this idea of portable transport is more expensive than all other means of transportation in the world. if this was so good, why other big transportation giants never thought of this? Good thoughts, Jameel. And actually, they promise to 10X people’s money, 1000%. It seems that this is the only transportation company in the world to make such a revolutionary project. I wonder if they have progressed with the construction so far. Thanks for discussing the subject. Let’s see what the future brings! Thanks for participating in the discussion, Grunta. Boa tarde a TODOS! Sou investidor na Skyway capital e amigo do Sr letto Lopez CEO da empresa no Brasil! Posso afirmar total veracidade dos projetos sw e o IPO já está bem próximo! 2019 IPO. Foram disponibilizados 175 bilhões de reservas de ações e hoje em outubro de 2018 restam menos de 3 bilhões de reservas apênas. Essas com direitos a dividendos. Thanks Gilson, all the best! I only see and read negative comments because they are afraid of failure! the same said the bitcoin and blah blah blah and worse was the bitcoin since there was nothing to support this! only trust, there were no governments or banks! and see today is considered a digital asset of value and every day there are regulations in different governments, skyway is real and we have advanced enough, stage 12 about to end, all investment is risk to put a taco business! even walking in the street brings risks if you want to invest 100% without risk better invest in the bank to give them a miserable commission of profits and they will be happy to see your investment. yes! Acuerdence that you can devalue your national currency in some crisis. Yes, sometimes we have to take risks, but it’s always worth investigating the offers before we do so. Thanks for adding your point of view, if you have any news regarding your investment, everyone would like to know! Thank you so much Armands. Very interesting videos. I embed the 1st one here. Too bad the 2nd video is in Arabic only and there’s no translation but I think it’s about the technical characteristics of the project. Let’s see what the future brings! I wonder how much people invested so far in Skyway. If you have any news I’d like to know. As i read all the comments from others. i am not confirm whether investment is trust-able or not.. Please suggest your valuable feed back of this question. They shouldn’t have made the numbers so obvious. $400 Billion dollar value on vaporware ? Giant profitable Corporations like Ford are only worth $100 Billion. They should have said $4 Billion . Someone mentioned 9kw to propel a 5 ton train 450 kph . That equates to 12 hp. An electric bicycle uses that much . My wife invested $500. Is there any way to sell her shares before the closing of the scam ? So you believe it’s going to be proved a scam after all. Maybe you’re right, it seems too good to be true! Now as concerns your question, I think you should research willing investors in forums (business or similar). Here’s a list of business-related forums I’ve compiled not long ago. These forums may lead you to other forums as well (they host external advertisements). Try to spot people that expressed interest (there are many) and contact them using private messages if possible. Or take a look at the positive Skyway comments here in this article and search these names online (check the photos as well). But you have to think of a convincing story why you want to get rid of these shares. If you have any news, I’d like to hear from you. Thanks for sharing your personal story. why did You not posted my Message ? Hi, your message is live! I am an investor in Skyway and have been for sometime. There currently are projects on the way in several countries and yes Australia have also invested into the technology. Technology park in Belarus is active, Dubai has invested billions. It’s up to each individual to make their own decision. If you are wanted to invest I would do it soon. This is only the start, there is a whole lot more going on with this company however, can not reveal. My source of information comes from million dollar investor. Hi Shell, very interesting. I wonder why you can’t reveal more about it. I’m sure there are thousands of people wanting to know a little bit more. If you have any news do let us know! I was also present at DUBAI during The Future Cities Show where the SKYWAY Company and Mr. Yunitskij concluded some REAL and IMPORTANT CONTRACTS with Future Buildings that will begin at the end of this Year. Dubai Important Delegations [promotional link removed], Abu Dabi [promotional link removed], Italy, San Marino [promotional link removed], Ekateringburg [promotional link removed], Russia and many other countries from all over the world are visiting and traveling on UNIBUS and UNICAR already certified worldwide with more than 73 licenses on all components of the production SKYWAY Technologies. These are Facts and not words [promotional link removed], if you are not able to translate the Materials from the Russian language this does not mean that the News brought on the sites of the SKYWAY Groups are not true. With the hope that you too Mr. Tasos would invest in the Ecological Future that will save the Planet I send you my kind regards. build #SKYWAY .. save the PLANET! Ero presente anche a DUBAI durante The Future Cities Show dove la Compagnia SKYWAY e Mr. Yunitskij ha concluso dei CONTRATTI veri ed Importanti con Costruzioni future che cominceranno alla fine di quest’Anno. Delegazioni Importanti di Dubai [promotional link removed] , Abu Dabi [promotional link removed] , Italia , San Marino [promotional link removed] , Ekateringburg [promotional link removed] , Russia e tanti altri Paesi da tutto il Mondo stanno visitando e viaggiando su UNIBUS e UNICAR già Certificati a livello Mondiale con più di 73 Patenti su tutti i Componenti della Produzione SKYWAY Technologies. Questi sono Fatti e non parole [promotional link removed] , se non siete in grado di tradurre i Materiali dalla Lingua Russa questo non vuol dire che le Notizie portate sui siti dei Gruppi SKYWAY non sono veritiere. Con la speranza che anche Lei Mr. Tasos investirebbe nel Futuro Ecologico che salverà il Pianeta le mando i miei Cordiali Saluti. Costruiamo #SKYWAY .. Salviamo il PIANETA ! I thought the video you mentioned about training would shed some light on the story but it had nothing to do with Skyway’s training. I only left one video link as all the videos were coming from the same channel. Thank you for contributing to this thread. Good luck with the project! I ALSO INVESTED LITTLE AMOUNT IN IT . BUT SOMETIMES I FEEL SKY WAY PROJECT IS GOING TO BE FUTURE BIG SCAM..PRE PLANNED BIG SCAM.. Thanks for sharing your thoughts, you made a nice move investing only a little if you aren’t sure about Skyway. And who can be sure when investing in any company? Hello Tasos, do you have an update on SkyWay? My friend invested £50 and I wanted to know if your opinion has changed? Hi Yasmin, my opinion has not changed. I think anyone that wants to invest should wait a little longer! Hi Eva, so, you don’t believe me? It is multi level crowd funding,not mlm,big difference,they sell education.People thought Facebook was a scam and lots of other investment opportunities,say no more.Skyway is the real deal. OK, let’s say it’s crowdfunding. How exactly are they going to pay-off their investors? And why is the real deal? Did you invest? Are you making any money? You say they sell education, I’ve read that too on their website when I published this article. But I could not find any page related to education. Can you provide any link that connects Skyway with education? Hope so.im planning to invest 200 $ ..
Keep us updated on your investment, Rajendra! Thanks for reading and for the video addition, Govindaraju! Impressive, let’s see what happens. I have a question though, have you invested in this company? If so, keep me updated. Can anybody tell me if I invest in anyway project then it’s helpfull for me or not? Noone can guarantee any earnings from investing activities Surinder. You have to decide on your own. Thanks for your input KPL, many questions regarding this company.